Like all Indian practices, proficiency in fighting with staff implies its usage while being surrounded by enemies. It causes the necessity for mastering the skill of free moving in any direction while spinning the weapon arbitrarily as well. Herewith it is necessary to mention two details. Spinning of the staff doesn’t depend on the direction of moving or direction of the turns of the trainee corpus. The second detail is that the actions with the staff, defensive or attacking, are firmly related to the moment of positioning the foot or, in other words, to the step rhythm of the trainee. That is, these actions are to be made strictly in the moment of his foot positioning, but at the same time they could be absolutely arbitrary. 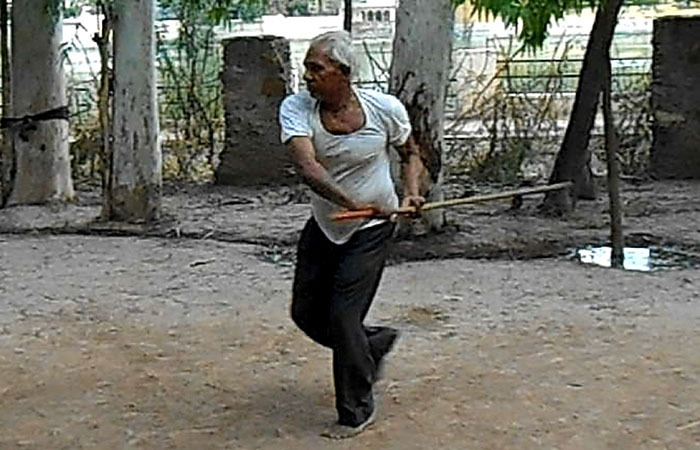 As it is possible to move in any direction, along the circle or spinning around yourself, just walking in the right direction, then it has the effect which is presented throughout the work with and without weapons and which looks like the attack or defense is made not by weapons or by hand, but only by the feet or steps, which sets the rhythm and pattern of the fighting. The only one thing which remains under the trainee’s control is the distance and direction for committing of technical actions. But eventually, it is possible to transfer responsibility for these actions on the experience and intuition. Thus two basic skills can be formulated as follows: (1) The trainee should not disturb the spinning of the weapon; (2) the spinning weapon should not restrict and determine the moving and actions of the trainee. During the training process it becomes clear that the staff moves almost independently due to its inertia. This movement gets energy from the moving of the trainee due to the skill, exposed by «pentra». As a result, the total control of the weapon is confined to the control of its center of spinning. That is, the trainee operates nor with a staff, neither with its end or its first one third, but with his own hands. It is important to mention that initially necessary skill of tight and even rigid holding of the staff eventually turns into ability of tight holding by relaxed, «alive» wrists. Subsequently all these skills can be applied to the operating with the saber and weaponless techniques as well. For natural reasons there is a limited set of trajectories for moving of the staff and movements, which could be made with it. A separate practicing of all possible options and combinations, taking into account the previously acquired skill of correct moving, eventually will lead to the desired result.